The Steamship Ham is ideal for special events, holiday's or family styled meals. It is maple cured for several days before being double cob-smoked, slow and low, for about 12 hours. 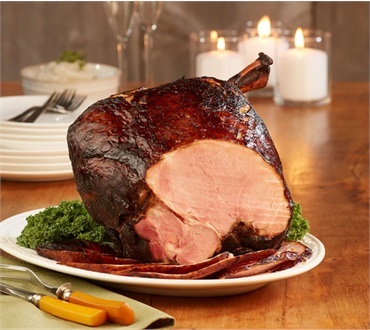 This exceptionally lean, full flavored Bone-In ham is delivered fully cooked and ready to gently warm and serve. There is no better choice on the market when the occasion calls for the very best, most flavorful carving ham centerpiece. This delicious Bone-In ham weighs an average of 16-18 pounds. I purchased this ham for our Christmas dinner the first time and now its my go to ham for all occasions. I think it just has best flavor, right amount of fat and is a hit with everyone who tries it. We served this on Christmas. We heated it up on our pellet smoker. It couldn't have been easier. It was, by far, the best ham I've ever had. Everyone was amazed at how moist it was, and the flavor was outstanding. The only problem is that it's too large to justify buying another one unless we are entertaining! I'm already trying to figure out when I can get the next one. If it was smaller, I'd have already ordered it. This is my new go-to. Served for Christmas dinner. Big hit, everyone took some home. I recommend you slice this special ham very thin for optimal flavour.